All great art has the power to make us question what higher authority or force of nature empowered someone to create a masterpiece. ‘Life of Pi’ is director Ang Lee’s artistic expression of faith on film that’s close to his very own version of the Sistine Chapel, minus the neck pain. 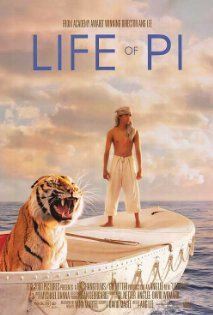 After a shipwreck the son of a zookeeper, Pi (Suraj Sharma), finds himself adrift in the Pacific Ocean on a lifeboat with a zebra, a hyena, an orangutan and a 450-pound Bengal tiger. Through flashbacks we glimpse Pi’s adolescence as the film returns to the older Pi (Irrfan Khan) to meditate on. The discussion between older Pi and a journalist (Rafe Spall) touches on the different religious beliefs and discoveries Pi has made in his youth. Getting inside both the older and younger Pi’s head aids in setting the stage for the tale of survival that is about to present itself. The plot thickens as the words of older Pi give way to Lee’s tantalising optical style and suddenly you’re caught in a moment of complete chaos as a freighter ship is crippled by the ocean’s fury. Witnessing the amazing visual storytelling of younger Pi’s entire life falling apart with sharks literally circling him is soul shattering. Climbing aboard the lifeboat Pi is faced with the challenge of staying alive in unruly company as well as finding the drive to want to live after suffering a great loss. The drive to survive comes from Pi’s faith and Lee showcases the beauty of the world adrift on the ocean. Faced with so much sublime splendour it’s hard not to believe that our creation comes from a higher power no matter what you believe in. To highlight the wonder a visual banquet is served up with neon jelly fish, spectacular electrical storms and the entrancing gaze of a tiger. The combination of a real tiger and the effects used to bring the jungle cat to life in the extreme setting is immaculate. The relationship between Pi and his fierce companion provides plenty of exhilarating moments coupled with tenderness as they learn to accept each other. Sharma does a great job of making the peculiar situation believable with his performance while developing a rapport with a slightly non-existent animal. ‘Life of Pi’ is heavily bookended and the film suffers a little for it. A good bulk of the middle section of the film is executed without the narration or reflection of the older Pi, but toward the finale you are jolted out of the past and back into the present. After so much of the story is told using spectacular visuals, it is let down by words. It’s almost as if Lee and screenwriter, David Magee lost faith in an audience’s perception of the story ingrained in the visuals. Interpretation gives way to lengthy explanations of the film’s events to literally spell out the ideas and it’s worse off for it. There is no denying that Lee offers up his finest cinematic work of art with ‘Life of Pi’, but the mechanics of delivering a crowd pleasing conclusion with drip-feed answers is like splattering paint across this potential masterpiece.